American Legion Park , also known League Park and Zebra Park was a baseball park in Jonesboro, AR and was the home field of the Jonesboro Zebras from 1909-1911, the Jonesboro Buffaloes from 1925-1926, the Jonesboro Giants from 1937-1938 and the Jonesboro White Sox from 1939-1941. The park was located at the corner of East Washington Avenue and Carson Street two blocks west of Main Street in downtown Jonesboro. The site was chosen in February 1909 after it was announced Jonesboro would field its first-ever professional baseball team by entering the Arkansas State League. Work to turn the grounds into a baseball park began almost immediately. The playing field was leveled out and a wooden, L-shaped grandstand capable of seating approximately 1,000 was constructed. Bleachers were also built on the 1st base side while separate seats on the 3rd base side were built for African-American fans. Various names were proposed for the park, but in the end, “League Park” was adopted. Jonesboro opened the regular season at their new ballpark on April 29th, shutting out the Hot Springs Vaporites. The team kept winning and was in first place on July 7th when the Arkansas State League disbanded. Soon afterward, the Northeast Arkansas League was formed as a replacement and Jonesboro finished the rest of the season on top of the standings. The Jonesboro Zebras continued playing at League Park until the league disbanded in 1911. A couple months after the season abruptly ended, the Jonesboro Wood Company acquired a lease on the land west of the park. The company then set up offices and began using League Park as a wood yard. The grounds remained in this fashion for the next 8 years until a Jonesboro city baseball league was created in 1919 and field was restored. In 1921, a new grandstand was built and a new fenced erected, while in 1922, new covered bleachers, dugouts, a press box and a director’s stand was all added. The park was also renamed Zebra Park. With all the improvements, professional baseball was once again ready to return to Zebra Park. And indeed, minor league baseball did in 1925 when the Jonesboro Buffaloes joined the Tri-State League and won the championship. 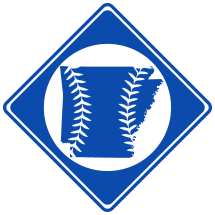 However, the league disbanded midway through 1926, and professional baseball didn’t return to Jonesboro for ten years until the Northeast Arkansas League was reestablished in 1936. Jonesboro played in the loop through 1941 at the renamed American Legion Park, but never won another championship. Today, the park is no longer standing. The former site of the ballfield is now underneath the Jonesboro Sun newspaper offices.